Construction is one of the industries that has the lowest digitisation rate along with agriculture and hunting (McKinsey, 2016). 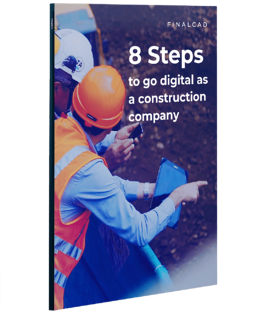 In this day and age, it’s imperative that construction companies who have not done so yet begin the process of digital transformation in order to compete with new market entrants. But where does one begin? We work hard helping construction professionals adopting new technologies and implementing digital change in their day-to-day job. This digital transition isn’t just about selecting the right tools, it’s about how to use them properly to make the most out of them. It’s also about changing our approach, and promoting a digital mindset throughout a company. Today, we are proud to introduce you to our brand new eBook that contains the eight most important steps to take action in this digital age. To learn more about how to implement change, and start taking action, click on the button below to download the eBook.